Photoshoot Prep Guide: Ready. Set. Glow. There’s no better feeling on the day of a photoshoot than knowing you did everything in your power to show up looking and feeling your absolute best. You’ve heard the word on the street that gorgeous, glowing skin is all about what you put in your mouth, not what you put on your face – that specific foods like blueberries, salmon, and parsley have a visible impact on your complexion, hair, and nails. It’s true. The power to influence your physical beauty from the inside out is backed with scientific fact, not just ancient wisdom – beauty really is more than skin deep. 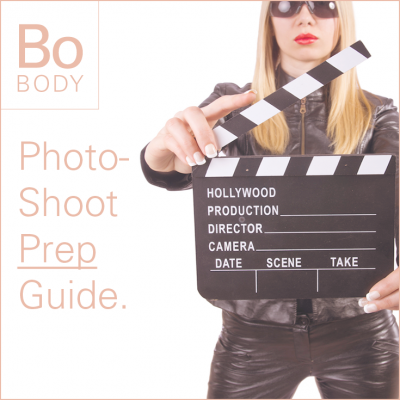 Use this photoshoot prep guide to get camera ready for your red carpet moment. The day you see your photos you will see the beautiful results and it will all be worth it. If you want to look and feel better fast, a whole foods detox, like NO TOX DETOX™ is the best beginning you can give yourself. When the day arrives for your photo shoot, your skin will be more radiant and the color, clarity, and tone will have improved. The whites of your eyes will be brighter and your body will feel lighter. No. 1 Start the day with a cup of warm water with freshly squeezed lemon juice to help cleanse the liver and improve digestion. A healthy digestive system is your key to unlock the beauty benefits of your food. Drink on an empty stomach, a half an hour before breakfast. No. 2 Go green, a green smoothie that is, for breakfast and another for a mid-afternoon snack. Liquefied nutrients make them easier to digest and assimilate. No. 3 Count colors, not calories. Focus on filling your plate with vibrant hues. Eat more of the natural reds, purples, greens, yellows, and blues, and less of the whites, beiges, and greys. Aim for at least three colors at each meal to support healthy beauty. No. 4 Get lean with protein. To find out how much protein you need, multiply your body weight in kilos by 0.8 (divide weight in pounds by 2.2 to get weight in kilos). For example, a 60kg woman would need 48g protein per day (60 x 0.8 = 48). If exercising vigorously, more protein is needed. No. 5 Strengthen skin cells, nails and hair with omega-3’s. Healthy fats are essential for strong cell membranes; well-hydrated, supple skin; and nutrient absorption. Think salmon, flaxseeds , and chia seeds . No. 6 Eat more, weigh less. Aim for five to six mini-meals each day, spacing them every three to four hours. Close the kitchen three hours before bedtime and make your last meal the smallest meal of the day consisting of lean protein, healthy fat, and non-starchy complex carbohydrates – think asparagus, Brussels sprouts, and broccoli. No. 7 Cook once, eat plenty. Spend a few hours on Sunday to plan meals, grocery shop and prep for the week. Try cooking a large batch of quinoa or brown rice , baking a couple sweet potatoes, and steaming some vegetables, while chopping others and placing in storage bags so you’ll always have healthy options on hand. No. 8 Move your body. Exercise for 60 minutes, six days a week with a combination of cardio, strength training and flexibility. Train at an intensity between 60-80% of your maximum heart rate (MHR). No. 9 Hydrate. Water is critical for cellular function at every level and is the skin’s best beauty elixir. Even weight loss cannot occur effectively without sufficient water. Aim to drink at least half your weight in ounces of water every single day. For a boost in cellular regeneration, add a teaspoon of spirulina to 10 ounces of water up to three times a day. The body hydrates more efficiently when we eat some of our water, too. Think watermelon, cucumber, and celery. No. 10 Pamper yourself. Relax in a hot bath of Epsom Salt at least three times a week to relieve sore muscles, de-stress, and help your body eliminate toxins. Or add a few drops of lavender essential oil to ordinary bath water to help with quality beauty sleep. No. 11 Get quality beauty sleep. By catching your nightly zzz’s you release a little something called human growth hormone, or HGH, which boosts skin cell production and collagen synthesis, while repairing and rejuvenating damaged skin cells. Aim for seven to nine hours. A night of quality sleep is better than a thousand beauty creams. No. 12 Banish the beauty saboteurs. Alcohol. Stresses the liver, an important organ for a radiant complexion. Leads to weight gain and dull skin. Caffeine. Increases cortisol levels, causing wrinkles and belly fat. Disrupts beauty sleep and is acidic to your body’s pH levels. Dairy. The most common food intolerance, causing bloating, gas, and digestive upset which prevents the body from breaking down and assimilating nutrients needed for glowing results. Fried Foods. Free radicals in fried foods cause wrinkles and inflammation (a.k.a. inflamm-AGING). Gluten. If you have skin problems or digestive issues, gluten could be the culprit. Gluten is a protein found in many grains including wheat, rye, and barley. Overcooked Foods. Destroys essential nutrients needed to fuel your beauty. Meats. Boosts inflammation in the body. Skip red meat and poultry in favor of other proteins such as salmon, free-range eggs, quinoa, lentils, and spirulina. Processed Foods. a.k.a. franken-foods, lacks beautifying ingredients, triggers inflammation and causes an overload to free radicals. Most processed foods are high on the glycemic index – think cereals, crackers, cookies, chips, and candy bars – causing a spike in blood sugar that contributes to acne, wrinkles, and hormonal imbalance. Salt. Water retention and bloating, and high blood pressure are a result of eating too much salt. Soda. Slows metabolism, causes weight gain, accelerated aging, tooth decay, and bone loss. Sugar. Directly contributes to weight gain, wrinkles, blemishes, dull skin, and cellulite. A major cause of Advanced Glycation End-products (AGEs) formation, which leads to a breakdown of collagen and connective tissue. No. 1 Smile and show those pearly whites. Now is the time to have your teeth cleaned and whitened. No. 2 How are your locks? Trim your ends, touch up any color and apply a clear gloss to add a high level of shine to your “mane” feature. If your hair is dry, do a deep conditioning treatment. No. 3 Wax on, wax off. Remove the hair from your legs, arms, underarms, and bikini line and shape the brows. No. 4 Go bare. Forego the foundation and let your skin breathe. No. 5 Book a full body scrub to slough off any dead skin cells. No. 6 Get a facial. As the blood flow is stimulated, your face will look healthy and radiant. No. 1 Remove starchy complex carbohydrates from your diet, this includes fruits except for berries. Limit yourself only to colorful vegetables and lean protein sources. No. 2 Avoid eating spicy food and salt until after the shoot. No. 3 If you haven’t been already, avoid alcohol to avoid a puffy face. No. 4 Gently exfoliate and moisturize the whole body each day. Turn a dull and dry complexion to a vibrant and smooth complexion. Regular exfoliation helps reduce fine lines and wrinkles, while moisturizing will keep the skin supple and hydrated. No. 1 Get a full body massage. In addition to releasing tension, you’ll glow as the flow of lymph that carries nutrients and filters toxins revs up. To do a self massage, warm some coconut oil and take ten minutes to massage into your whole body, starting at your limbs and working inward toward your heart. Rinse your skin in the shower but try not to wash away all the oil. The oil will keep the skin supple and hydrated, two beautifying effects in one. No. 2 Get rid of any facial hairs, but do not wax. Waxing could cause pimples, so don’t risk it. No. 3 Tidy the eyebrows. No strays on your big day. No. 4 Get a manicure and pedicure. Neutral fingers, fun toes. No. 5 Go to bed early. Remember, a night of quality sleep is worth a thousand beauty creams. No. 1 Eat light and within two to three hours of the shoot. No. 2 Have fun…because you glow, girl. If you’ve got any Q’s just leave us a comment below. We’d love to hear about your shoot, too! Or if you’ve got any photoshoot success tips you’d like to share, do let us know! One Response to Photoshoot Prep Guide: Ready. Set. Glow. Wow! It’s like you read my mind! You seem to know a lot about this, like you wrote the book in it or something. I think that you could do with some pics to drive the message home a bit, but other than that, this is informative blog post. A outstanding read. I will certainly revisit again.